Separate collection of textiles comes–are we ready? The amendments to the EU Waste Directive are going to considerably change the utilization of textile wastes, as by 2025 European countries will have to organize separate collection for textile wastes. However, mere collecting isn’t recycling and therefore solutions for the further refinement of textiles are urgently needed. 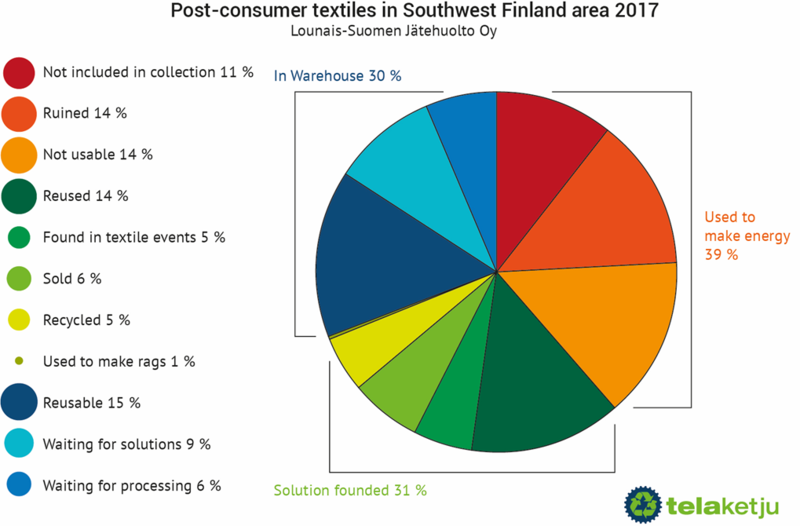 Lounais-Suomen Jätehuolto (LSJH), a municipality owned waste management company in southwest Finland, has been running over two years a collection experiment of end-of-life textiles, which has produced a lot of valuable information on the opportunities for utilizing end-of-life textiles in Finland. These two years have shown that people are willing to sort textiles separately from mixed waste. In 2017, LSJH received nearly 120,000 kilograms of end-of-life textiles from households. End-of-life textiles are received at the LSJH waste centres and sorting stations and further hand sorted by Turku region TST association at the Texvex workshop. Almost a third of collected end-of-life textiles have been recycled or reused and another third is in storage waiting for reuse or processing. Over 10% of all collected mass was incorrectly sorted material, i.e. mattresses, rugs, lingerie and small home items. 14% of collected material was either dropped it the collection containers wet or mouldy or it was spoiled in containers or transport. Around 14% of the textiles in the collection are unidentifiable, fibre blends or layered structures consisting of different materials. Incorrectly sorted, spoiled and unidentified textiles have been exploited in heat and energy production in waste power plants. Reusable textiles are redistributed every month through rummage events and through direct orders from producers. The quantity of end-of-life textiles being reused could be increased by developing the subscription system further. We know how effective collection of end-of-life textiles is arranged and Finland is ready for it. There have been great advances in manual and automatic sorting in Finland and abroad, through which technology for the processing of textile fibres is now available. However, this does not matter if we cannot find end-users for textiles collected from households. We must push new industries to try products, where it is possible to use end-of-life textiles as raw material. 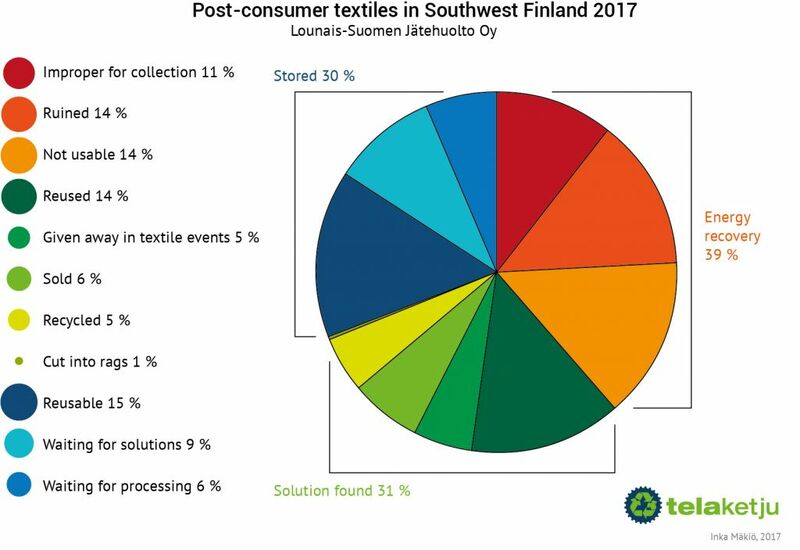 Telaketju wants to be a trendsetter and lead the way for textile recycling so that Finland would be ready for the change in waste directives well before the year 2025. All EU countries are facing the same question: what to do with the separately collected textile waste? With the right solutions, Finland will be a step ahead of others. In cooperation, we build an industry that creates new businesses and jobs in Finland. Text by Henna Knuutila, Marketta Virta, Sini Ilmonen and Inka Mäkiö.